A bright future for Utah State University Eastern was affirmed by the Utah State Legislature March 13 when it voted in favor of funding a $20 million Central Instructional Building for the Price campus. The funding bill, which still must be signed by the governor, comes 11 years after the completion of the college’s last major structure, the G.J. Reeves Building, which houses programs in science and technology. This new building will literally connect the two structures it sits between, the Reeves and the Geary Theater. It will house theater, music, art, criminal justice, and communications and provide needed classroom space for general and vocational education. It is not just a building that the legislature approved, it is also an affirmation of the college’s mission to prepare the people who will create and sustain the Eastern and Southeastern regions of Utah, said USU Eastern Chancellor Joe Peterson. The new building will serve as a linchpin to the college’s Building Vitality Campaign that seeks much-needed structural upgrades to improve the overall curb appeal of the 75-year-old campus. And talk about curb appeal. 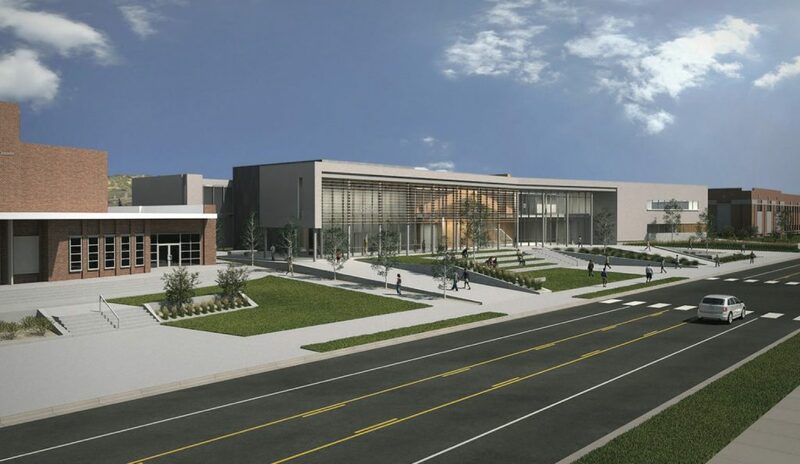 Located at the entrance of the college, the Central Instructional Building (CIB) will span the curb along 400 North, occupying some 36,000 square feet of space. Its broad and expansive design with ample windows and lighting will serve as a beacon to students, community members and visitors alike. Peterson’s vision and excitement for this new building and its importance to the continuing vitality of the college and region spills over when he describes to students and faculty what to expect in the coming months. His assuredness in the details attests to the hours he has pored over the plans over the past four years since becoming USU Eastern’s first chancellor. He took the helm in 2010, the same year the former College of Eastern Utah merged with Utah State University. Peterson said the college will continue to use the music building and the SAC – the old student activity center — until Fall 2015. After that, those buildings will be demolished. A new grassy quad for the college will be planted where the SAC now stands. “These changes will require us to be adaptive, but our ability to use the music building and SAC during the construction of the new building will save a lot of headaches,” he said. As part of the project, the Geary Theatre will be seismically stabilized and expanded. “Through coming years, we will revitalize the Geary and make it a fitting partner building for our new building,” he said. Space planning is still underway for several programs that will need to be relocated. He assured faculty, staff and students impacted by this that they will be involved in the planning.